We make our authentic and delicious guacamole daily with fresh avocados, tomatoes, peppers, onions and fresh herbs. Served with hot fresh corn tortilla chips. Our famous Pollo Fundido, a red beef and a green corn tamale, topped with sauce, taquitos with guacamole. Served with black beans and two fried chili peppers. A creamy, slightly spicy dip of frijoles refrito, our ever popular fundido cream sauce, cheese, and pico de gallo. Two soft corn tortillas stuffed with our mesquite grilled Carne Asada, then topped with cabbage, onion and cilantro. Our traditional Mexican version. Shrimp, avocado, cucumbers and spices are served marinating in a mouth-watering tomato broth cocktail. Fresh shrimp inside two lightly fried corn tortillas, filled with lettuce, queso fresco, red onions, shredded carrots and crema fresca. Our famous handmade tamales. One green chile corn tamale and one red beef tamale. Served in the husk with a drizzle of sauce. Fresh roasted jalapenos stuffed with two cheeses and grilled chicken, drizzled with our house special Vera Cruz sauce. Four crispy corn tortillas filled with shredded beef or chicken. Topped with shredded lettuce, carrots, red onions, tomatoes and cotija cheese. Served with our Avocado/Tomatillo & Chipolte salsas. Hot bubbling cheeses blended with yellow chiles, onions and tomatoes. Served sizzling at your table, with pico de gallo, limes and fresh corn tortillas. Add chargrilled scallions $2.99. Add Mochomos (specially seasoned, crispy beef), or grilled chicken $6.00. Two handmade crispy shredded beef or chicken tacos. A unique blend of spinach, onions, tomatoes and jalapeiio cheese. Served with hot corn tortilla chips. Our housemade chips with a trio of salsas, including our original mild salsa, our Tomatillo salsa and Chef Regino’s Award Winning Chipotle Picante Salsa. First basket complementary. Five large shrimp sauteed and served with your choice of the delicious sauces. Served with corn rice & grilled vegetables. Habanero – a cream sauce made with Habanero peppers (slightly spicy). Veracruz – an authentic salsa of tomatoes, Caribbean peppers, olives, wine, onions and spices. Tequila Lime – fresh garlic, cilantro, olive oil, citrus juices and Sauza Gold Tequila. Chef ’s seafood filet sauteed with your choice of the homemade sauces. Served with corn rice & vegetables.Veracruz – an authentic salsa of tomatoes, Caribbean peppers, olives, wine, onions and spices. Habanero – a cream sauce made with Habanero peppers (slightly spicy). Chef ’s seafood selection in a Negra Modelo beer batter that is light and crispy, then stuffed into corn tortillas with cabbage and a creamy pasilla sauce. Served with black beans and rice. Small portion $11.99. Chef ’s seafood selection, marinated and grilled, placed in corn tortillas with cilantro pesto and shredded cabbage. Served with pico de gallo, black beans & rice. Small portion $11.99. Mixed greens topped with fresh avocado, black beans, roasted corn, red onions, cucumbers, fresh tomatoes, cotija cheese and a lemon vinaigrette dressing. Mixed lettuce, toasted pepitas, red onion, cotija cheese, diced tomatoes and jalapeno Balsamic dressing. Mexican meatballs in a savory beef broth with fresh vegetables. Our famous Chile Verde served hot in a bowl with a tortilla. Mixed greens, cucumbers, red onion and tomatoes, topped with cotija cheese and your choice of dressing. Corn tortillas stuffed with two cheeses, then topped with red or green chile sauces. Served with beans and rice. Small portion $8.99, Add chicken $14.99, Add beef $15.99. Lamb roasted in chef’s special barbacoa sauce with carrots and potatoes. Served with fresh corn tortillas. 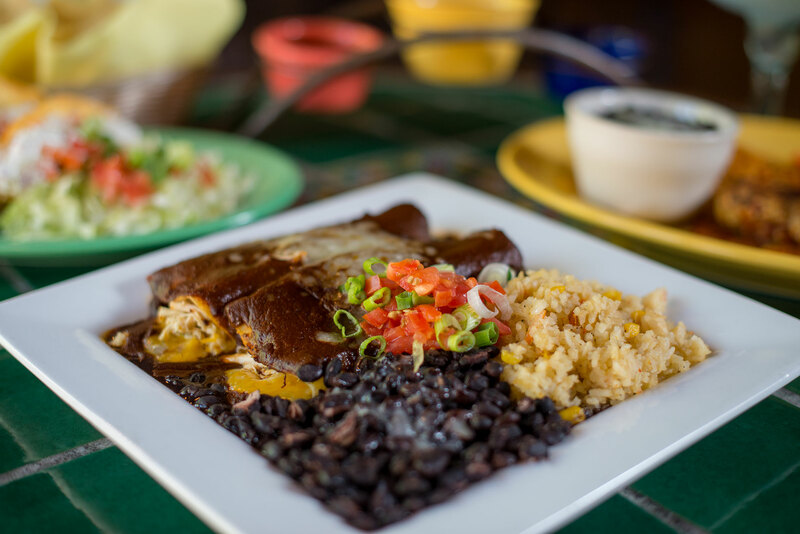 Chicken enchiladas topped with our authentic mole sauce. Served with black beans and corn rice. Small portion $11.99. A large fresh roasted Anaheim chile stuffed with refried beans and our grilled chicken, then topped with entomatada sauce and jack cheese. Served with black beans and corn rice. Our slow roasted pork, served with Tomatillo Chipotle sauce, cabbage, cilantro, black beans and fresh corn tortillas. A cheese enchilada, beef taco and a red chile tamale. A beautifully roasted poblano chile, stuffed with mesquite grilled tender Sirloin steak and fundido mashed potatoes topped with a chile poblano sauce. Served with roasted vegetables. Two corn tortillas filled with a sautee of vegetables. Topped with a culichi cream sauce. Served with corn, rice and black beans. A tender maintated steak, mesquite grilled to perfection. A corn tortilla stuffed with cheese, topped with our red or green sauce. Served with rice and beans. Add chicken $2.00 or beef $2.50. A half order of chicken or beef fajitas, grilled with red and green peppers and onions. Served with refried beans, pico de gallo and a flour tortilla. A corn tortilla stuffed with roasted chicken and cheese, then topped with our mole. Served with rice and beans. A crispy corn tortilla, topped with refried beans, cheddar and jack cheese, lettuce, and tomato. Add chicken or shredded beef $3.50. Add guacamole or vegetables $2.75. Our juicy burger, grilled to order. Served with french fries and lettuce and a tomato garnish. Choose between the following toppings: Cheddar cheese, jalapeno jack, grilled onions, roasted green chilies, jalapenos or avocado. Add $1.00 each. Chef ’s seafood selection, grilled to perfection and topped with pico de gallo. Served with rice and a tortilla. A shredded beef taco, a cheese enchilada and refried beans. Our marinated & chargrilled chicken breast served on a sesame seed bun. Served with french fries and a lettuce and tomato garnish. Choose between the following toppings: Cheddar cheese, jalapeno jack, grilled onions, roasted green chilies, jalapenos or avocado. Add $1.00 each. Our slow roasted carnitas stuffed into a traditional mexican torta with chipotle sauce, guacamole, lettuce, tomato, mayo, pickled jalapenos and red onions. Served with fries. Our famous fundido in a lunch sized portion. Served with rice. Our delicious carne asada stuffed into a warm tortilla with pico de gallo. Served with refried beans. Our tender pork carnitas fill a warm tortilla topped with green sauce. Served with Mexican rice. Our marinated and grilled Carne Asada stuffed into a traditional mexican torta roll with mayo, guacamole, jalapeno jack cheese, lettuce, tomatoes and pickled jalapenos. Served with fries. Scrambled eggs with tortillas, grilled chicken, green chilies, tomatoes, cheddar cheese and salsa. Served with refried beans. All beef chorizo scrambled with eggs, salsa and cheddar cheese. Served with refried beans. A flour tortilla filled with three scrambled eggs, tomatoes, onions, cheddar cheese and bell peppers. Served with refried beans. Machaca sauteed with scrambled eggs. Served with refried beans. 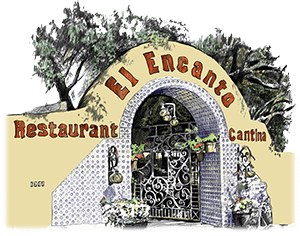 Two eggs over easy served atop a corn tortilla with green chile or spicy ranchero sauce and melted jack cheese. Served with refried beans. Chef’s selection of fresh vegetables sautéed in a skillet with eggs.Topped with melted Jack and Cheddar cheese. Our delicious frittata blended with ham and topped with Jack and Cheddar cheese. (cooked to order) with beans and tortillas. All kids item's are $4.99 and include a soft drink or milk. Refried beans in a flour tortilla. Served with rice. 2 chicken or beef taquitos. Served with beans. Hamburger** with french fries. Add cheese. $0.50. Turkey hot dog served with french fries. Scoop of Cinnamon or Mint Chip ice cream. $1.99.